Spitalifields in London's East End is famous as the old slashing ground of Jack the Ripper, and as the home of Gilbert and George. It was also the original home to the oldest umbrella maker in the country, James Ince & Sons. The company is now based in v. nearby Vyner Street, Bethnal Green. The company was founded in 1805. Richard Ince is the mind-boggling sixth generation of umbrella-maker to head the company. A small ripple of applause for Mr Ince please, gentlemen. Ince Umrellas are cut, made and finished by hand. Covers are cut and sewn to form eight panels, which are then stretched and fitted over the umbrella frame, which are then stitched to the spokes. 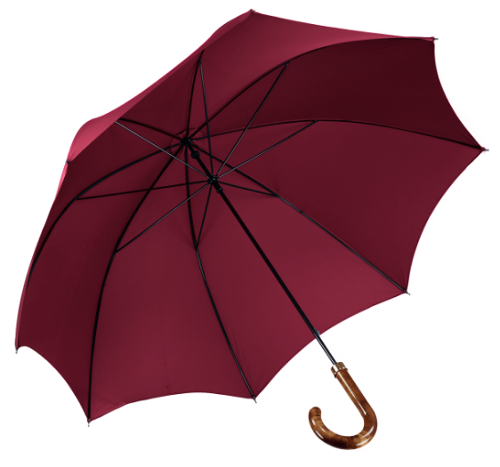 The umbrella is then finished inside and out with rosettes — mini canopies that cover the exit of the shaft to the top of the umbrella and the spokes on the inside. It was nice to read that James encourages a 'safe, happy and productive workforce' that enables a 'good work life balance'. That kind of thing keeps you in business for over two hundred years. That and not erasing centuries of heritage and experience by offshoring the manufacturing. 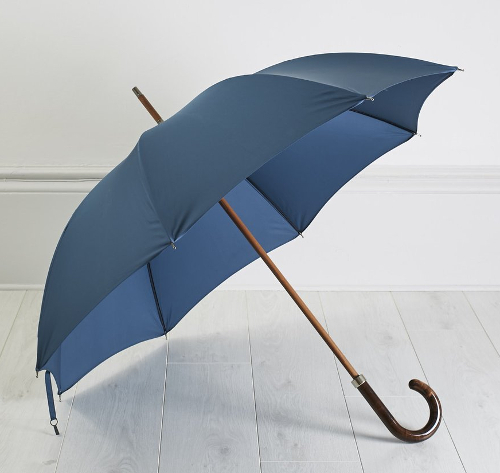 Ince have slim, solid stick and folding umbrellas for gents. They make the covers in a wide range of colours. 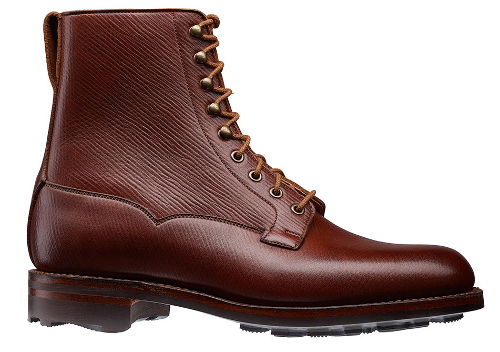 You can't buy direct, but our type of retailer stock them, such as special friends Cad & The Dandy. Cad & The Dandy stock the Gentleman's Walking Umbrella by Ince, which has a metal shaft and spokes, and a maple handle. That's the wine-coloured version at the top, but they stock quite a few weekend (including yellow) and work colours. If you're more of a solid stick man, Bleak House of London had the Bleak House Gent's Umbrella with a wooden shaft you see below. 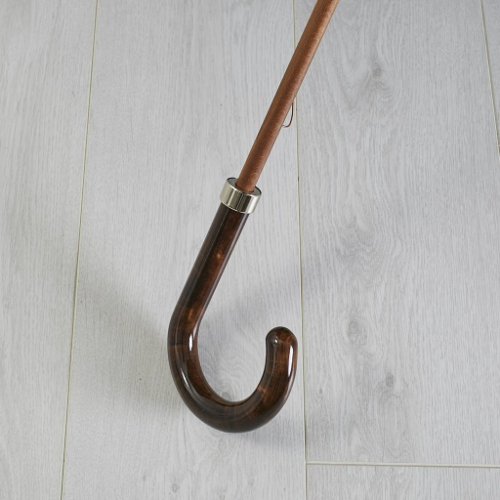 Made by Ince, the umbrella has a solid wooden shaft, metal spokes and a scorched and polished maple handle. Though currently out of stock, it comes in a rather splendid and very adaptable blue. If you ask Bleak House nicely, they may put in another order from Ince. If you have an example of an early Ince umbrella — the earlier the better — as the unofficial annalists of British men's style, we'd be more than willing to share with our readers. Thank you for the lovely mention. 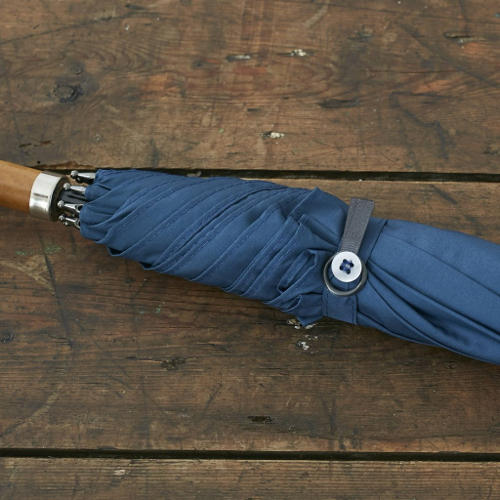 We love Ince umbrellas to bits and we hope to have more gents umbrellas in soon.